The family remains central to the continuity of the contemporary American Jewish community. But how the Jewish family is Jewish (and ‘how Jewish’ Jewish families are) varies widely and touches on fundamental assumptions about Jewishness, even as the family shapes the very Jewishness to which it contributes. Today’s Jewish family is faced with important challenges in its effort to fulfill its functions, both traditional and contemporary. Confronted with declining rates of marriage, delayed marriage, low fertility, and interfaith marriage, contemporary family patterns appear to contribute to a shrinking Jewish population. Jewish engagement promotes healthier family-oriented behaviors. Yet some families, marginalized by the mainstream Jewish community, find it difficult to be engaged Jewishly on a communal level, because of their special needs or conditions, such as economic vulnerability, immigrant status, multiracial/cultural diversity, and sexual orientations. Family profiles vary across Jewish communities, adding to difficulties in meeting diverse needs. It is therefore important to understand the American Jewish family today, its dilemmas and challenges, as well as its major sources of diversity. 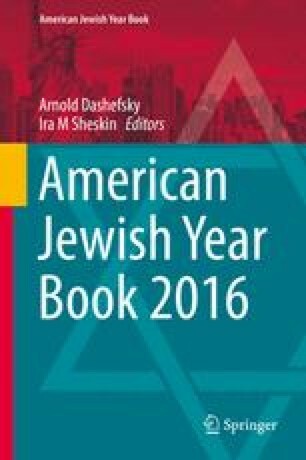 This chapter reviews the research about contemporary American Jewish families and discusses implications of cutting-edge studies for the contemporary Jewish community. The Pew Research Center Survey of US Jews was conducted February-June, 2013 among a nationally representative sample of US Jews. Interviews were completed with 3475 Jews, including 2786 Jews self-identified by religion and 689 self-identified Jews of no religion. Details on the survey can be found in Pew Research Center (2013). The data set is available for public use, and unless otherwise noted, calculations presented are by the author. For those calculations, the sample was defined as someone who self-identified as Jewish by religion (JBR) or as someone with no religion who had at least one Jewish parent. This criterion was adopted to make the statistics comparable to calculations made by the author from the NJPS 1990 and NJPS 2000–2001 (Hartman and Hartman 1996, 2009). The Decade 2000 data set was compiled by Ira M. Sheskin, combining data from the 22 Jewish community studies conducted by Sheskin as the principal investigator from the completion of NJPS 2000–2001 through 2010. This data set includes 19,800 20-minute interviews, and is a random sample of 547,000 Jewish households in the 22 communities. More details on the data set can be found in Hartman and Sheskin (2012). The ORANJ BOWL (Ongoing Research on Aging in New Jersey: Bettering Opportunities for Wellness in Life) survey was conducted by the New Jersey Institute for Successful Aging between November 2006 and April 2008 using random digit dialing (RDD). A sample of 5688 community-living adults ages 50–74 included 527 of Jewish religion. In comparison to the Pew 2013 survey and the three New Jersey community samples conducted during 2001–2010 (Atlantic County, Bergen County and Middlesex County), the Jewish sample had a comparable percentage of women, comparable marital status distribution, was slightly younger, slightly less likely to be living alone, and of somewhat higher household income. Education and employment status was comparable to the Pew distribution but more educated than the community study samples in Decade 2000. Respondents self-identified by religion, which means that those who identified as Jewish but not by religion were not included in the Jewish sample. More information on the study can be found at http://rachelpruchno.net/OB.html. Adams, S. 2015, February 2. The best cities for singles. Forbes. http://www.forbes.com/sites/susanadams/2015/02/02/the-best-cities-for-singles/#14a6397a46f7. Briley, J. 2012. 10 great cities for older seniors. AARP. http://www.aarp.org/home-family/livable-communities/info-06-2012/great-cities-for-older-singles.html#quest1. Cohen, S.M., and A.Y. Kelman. 2008. Uncoupled: How our singles are reshaping Jewish engagement. Jewish Identity Project of Reboot. http://www.bjpa.org/Publications/details.cfm?PublicationID=3322. Cohen, S.M., C. Aviv, and J. Veinstein. 2009. Welcoming synagogues project: Preliminary results from the 2009 Synagogue Survey on Diversity and LGBT Inclusion. Institute for Judaism and Sexual Orientation (IJSO), Jewish Mosaic: The National Center for Sexual and Gender Diversity. http://www.bjpa.org/Publications/details.cfm?PublicationID=670. Goldstein, E. 2007, July 5. Jews of many colors. The Jewish Week. http://www.thejewishweek.com/special_sections/text?context/jews_many_colors. Green, E. 2014, November. Keeping the faith. The Atlantic. http://www.theatlantic.com/magazine/archive/2014/11/keeping-the-faith/380799/. Jewish Community Study of New York: 2011—Special Study on Jewish Households with LGBT (Lesbian, Gay, Bisexual, or Transgender) Individuals. Jewish Community Study of New York: 2011. 2014, June. UJA-Federation of New York. http://www.bjpa.org/Publications/details.cfm?PublicationID=21228. Keysar, A. 1994. Single-parent families’ participation in the Jewish community. Journal of Jewish Communal Services 70(2–3). http://www.bjpa.org/Publications/details.cfm?PublicationID=3322. Kotler-Berkowitz, L. 2014, May. The great recession and American Jews: Evidence from Baltimore, Chicago and Cleveland. New York: Berman Jewish Databank, Jewish Federations of North America. http://www.jewishdatabank.org/Studies/details.cfm?StudyID=742. Lubrano, A. 2014, September. 17. Jews are the hidden poor. Philadelphia Inquirer. http://articles.philly.com/2014-09-17/news/53988618_1_poverty-poor-jews-allen-glicksman#AzyLt3j5mqx1w6xg.99. Scheckner, J. 2003, June. Challenges in outreach to GLBT Interfaith Couples. Big Tent Judaism/Jewish Outreach Institute (JOI). http://www.bjpa.org/Publications/details.cfm?PublicationID=7775. Sheskin, I.M. 2004, October. Geographic differences among American Jews. United Jewish Communities (UJC). http://www.bjpa.org/Publications/details.cfm?PublicationID=865. Sheskin, I.M. 2015. 2015 Comparisons of Jewish communities: A compendium of tables and bar charts. North American Jewish Data Bank. http://jewishdatabank.org/Studies/details.cfm?StudyID=777. Siegel, B. 2015, March 6. Sign on the dotted line. Tablet. http://tabletmag.com/jewish-life-and-religion/189149/sign-on-the-dotted-line?utm_source=tabletmagazinelist&utm_campaign=15e0a76659-Friday_March_6_20153_6_2015&utm_medium=email&utm_term=0_c308bf8edb-15e0a76659-206693185. Tobin, D. 2012, June 20. 1 in 4 New York households identify as non-white or Sephardic. Huffington Post. http://www.huffingtonpost.com/diane-tobin/1-in-4-new-york-jewish-ho_b_1597492.html. Wertheimer, J., and S.M. Cohen. 2014. The Pew Survey reanalyzed: More bad news, but a glimmer of hope. Mosaic. http://mosaicmagazine.com/essay/2014/11/the-pew-survey-reanalyzed/. Zellman, R. 2004, January 1. Making your community more transgender-friendly: Guidelines for individuals and congregations. TransTorah. http://www.bjpa.org/Publications/details.cfm?PublicationID=7781.